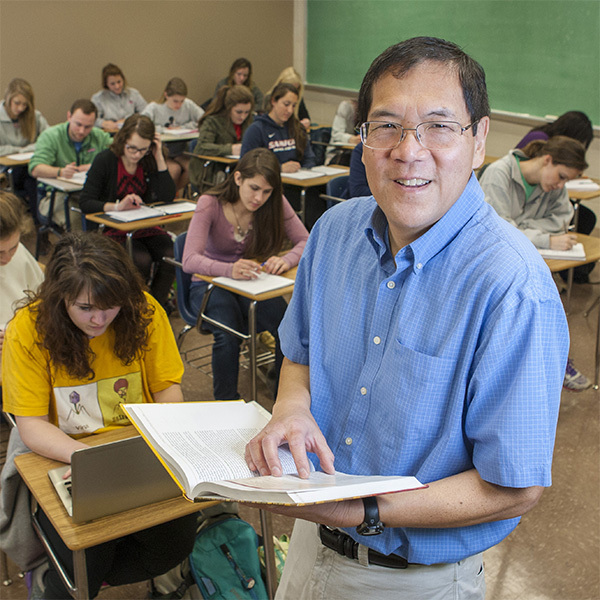 Stephen Chew, Samford University Psychology Department chair and internationally recognized expert on teaching and learning, has earned the American Psychology Foundation’s (APF) Charles L. Brewer Distinguished Teaching of Psychology Award. The award, recognizing a significant career of contributions of a psychologist who is an exceptional teacher of psychology, will be presented at the annual convention of the American Psychological Association (APA) in August. The APF is the foundation arm of the APA, the leading scientific and professional organization representing psychology in the United States, with more than 115,700 researchers, educators, clinicians, consultants and students as its members. The Brewer award is all the more meaningful to Chew because he has gotten to know its namesake through many years of professional conferences. “He’s a giant in teaching psychology,” Chew said. But Chew has become a giant as well, and the Brewer award is the latest honor is a career packed with them. Chew previously served as a Carnegie Scholar and Fellow of the American Psychological Association. He has earned Samford’s Buchanan Teaching award, the Society for the Teaching of Psychology’s Robert S. Daniel Teaching Excellence Award and the Carnegie Foundation for the Advancement of Teaching’s state and U.S. Professor of the Year honors. That record of influence might suggest an Ivy League professor who divides his time between groundbreaking research and top-tier graduate students, but Chew has spent the last 35 years focused on undergraduate education at a relatively small, private university in Birmingham, Ala. “I love undergraduate teaching,” Chew said. An early champion of undergraduate research at Samford, Chew worked with student Adrienne Hampton ’09 on a project that was the judges’ unanimous choice for the 2010 National Institute on Teaching Psychology’s Scholarship of Teaching and Learning Award. “I’d love to do more work like that,” Chew said. And although he has a wish list of personal research projects, he has never even taken a sabbatical at Samford to pursue those. Instead, he finds areas of common interest with students like Hampton, collaborates with them, and applies cutting-edge research to help them learn. That emphasis on mentoring and improving the quality of teaching and learning has led Chew to present annual student convocation programs. Those, in turn, broadened to become his acclaimed video series on How to Get the Most Out of Studying and Cognitive Principles of Effective Teaching. The former series has been viewed more than a million times and is in use at educational institutions worldwide. His current research with undergraduates and Samford colleague Jack Berry continues that practical focus, this time exploring the role of student trust in teaching. Sharing what he learns sometimes means confronting popular misconceptions, myths and misdirection in education. Chew has, for example, sought a way out of education’s “buzzword wasteland,” and challenged fad-driven change that doesn’t represent real progress in teaching and learning.